A platform game that sounds more like a dangerous medical condition...or the final chapter in a dodge ball trilogy. Unlike most video game franchises, it's OK to enjoy Red Ball 3 without playing the previous two games, neither of which is available on the App Store. That said, the basic formula remains largely intact. 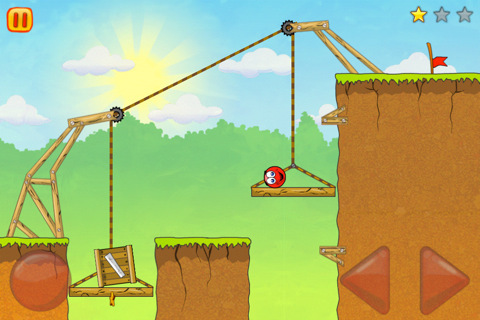 Each of the 20 levels task you with guiding a red ball with a smiley face from point A to point B using on-screen left/right arrows and a jump button. Beating a stage requires a moderate amount of skill, since you must solve physics based puzzles. These come in the form of activating pulleys, hitching a ride in a mine cart, piloting a helicopter and leaping across multiple chasms, no easy feat. On top of that, you should be on the lookout for three gold stars per level, most of which reside in hard to reach places. Grabbing them all should keep you busy after running through the game. It's a solid effort overall, but not incredible by any means. If anything, the game grows a bit frustrating, since the aforementioned jump button is tiny and therefore tougher to press on the iPhone. We also disagree with Chillingo's decision to release both a standard and HD version, the latter of which costs $1.00 extra. 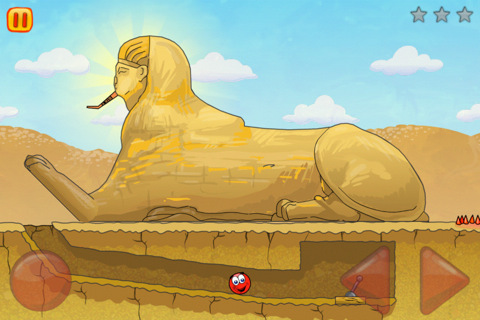 In the end, Red Ball 3 is a good platform game that falls short of Chillingo's previously released and superior Storm in a Teacup, but if you crave a challenge, it offers that and more. What's Hot: Quite challenging, well thought out puzzles. What's Not: HD version costs extra, buttons harder to press on iPhone, only 20 levels, minimal presentation.